Commentary: In case you were wondering how water utilities thawed out pipes in 1914…For reasons that are a bit of a mystery to me, this post is a favorite with water utility folks. I have had many comments from managers that they have passed this one around to their fellow workers and colleagues. I certainly think that the picture of the apparatus is amazing. This entry was posted in Year 7 TDIWH and tagged Columbus, drinking water, Ohio, water, water pipes on January 29, 2019 by safedrinkingwaterdotcom. This entry was posted in Year 6 TDIWH and tagged Columbus, drinking water, Ohio, water, water pipes on January 29, 2018 by safedrinkingwaterdotcom. Commentary: In case you were wondering how water utilities thawed out pipes in 1914…For reasons that are a bit of a mystery to me, this post is a favorite with water utility folks. I have had many comments from managers that they have passed this one around to their fellow workers and colleagues. This entry was posted in Year 5 TDIWH and tagged Columbus, drinking water, Ohio, water, water pipes on January 29, 2017 by safedrinkingwaterdotcom. This entry was posted in Year 4 TDIWH and tagged Columbus, drinking water, Ohio, water, water pipes on January 29, 2016 by safedrinkingwaterdotcom. This entry was posted in Year 3 TDIWH and tagged Columbus, drinking water, Ohio, water, water pipes on January 29, 2015 by safedrinkingwaterdotcom. 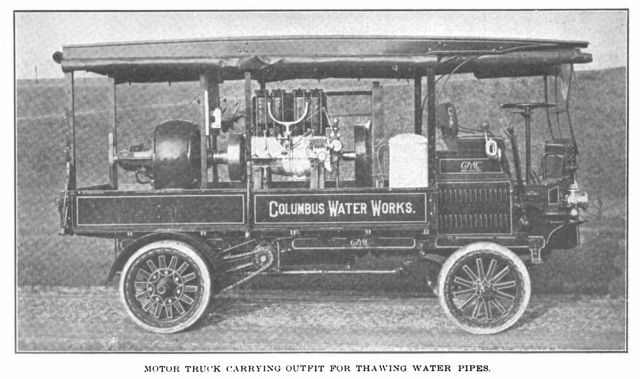 This entry was posted in This Day in Water History and tagged Columbus, drinking water, Ohio, water, water pipes on January 29, 2013 by safedrinkingwaterdotcom.